It has been a busy few weeks as we have got into our stride showing off 509. 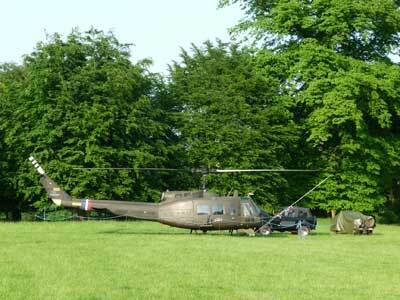 Saturday 31st May and Sunday 1st of June it was the turn of the Airborne Assault Extravaganza at Newby Hall near Ripon. 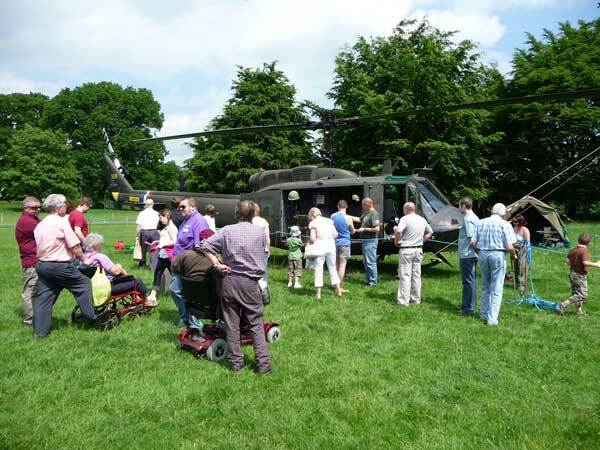 The Huey Team had been contacted by the organisers several months ago explaining that the show was to support our troops returning from Afghanistan and Iraq . Several other helicopters would be there so we would be in good company. The Huey was to be flown by Phil with me acting as ballast in the front and helping with the navigation, checking radio frequencies etc. At the last minute Nina decided she would drive across to make contact with the organisers and to be there when we arrived. Phil and I were at the airport early to ready Huey to fly and pack all our gear in the back. It never ceases to amaze us just how much kit we take with us, even when travelling 'light'. It's a good job it's a Huey we show off, I just don't know how we would cope with anything smaller!! After checking the weather, which due to patchy mist had delayed us taking off, we eventually got into the air shortly after a 10:15 a.m. Once in the air the visibility was good except for what looked like some mist and murk over the Pennines . The GPS had been programmed by Phil so he tracked using that with me double checking on the map. We kept in contact with Blackpool on the radio until we reached Skipton when we switched over to Leeds Bradford ATC. As we got closer to the hills that separate Lancashire from Yorkshire the mist had started to dissipate so there was no need to look for an alternative route. Some 30 minutes after lifting from Blackpool we had Newby Hall in sight. Out came the aerial photos of the site so we could see how everything was laid out. We found the church which was to be our reference point for our circuit to check out the landing site. All eyes were skywards as we made a couple of circuits to make sure we were happy with the approach over the trees. We headed for the 'H' marked on the ground and we made our final checks before beginning our landing. As we popped over the trees we saw our host guiding us in with Nina behind him. We were guided straight down to where we would stay for the weekend. On the ground the rotors were secured and the three of us sprung into action like a well oiled machine and in no time at all the kettle was on, shortly followed by the tent going up and the Huey being emptied of all our gear. Then the TV was up and running with our little generator purring away right at the tail of the aircraft. A rope was acquired and set up to create a safe area around the helicopter. In no time at all people made the long trek up the field to get their first glimpse of this huge machine. Sunday dawned very very wet. We'd heard the forecast but were confident that it would get better. 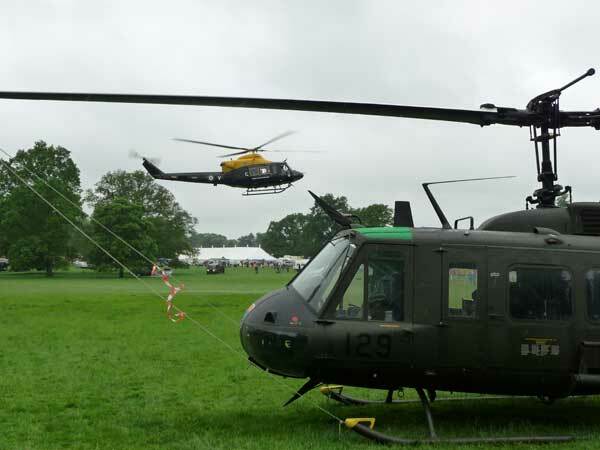 As the morning progressed, with a few very determined visitors coming to see the Huey, it was looking like we may have to stay an extra night. Phil kept in touch with Neil Airey for the latest weather situation in Blackpool as he was on duty with the North West Air Ambulance. Weather was just as murky as Yorkshire but a little drier. Still we had visitors arriving to talk to us about 509. 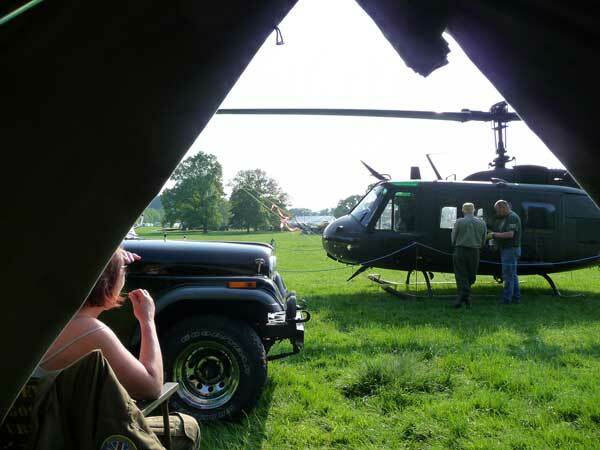 By midday it was clear that there would be virtually no more visitors coming in through the gates so we started to pack all the equipment in to the back of the Huey leaving just the essentials in the tent. This would give us the option either to pack the remainder quickly and fly back to Blackpool or to be able to stay an extra night without unloading everything out again. There was supposed to be a break in the weather around four o'clock but it arrived early so we quickly finished packing the tent in to the back of the helicopter. We prepped her for flying and with the security guards keeping anyone nearby at a safe distance while we wound her up and lifted into the sky. With one noisy circuit we set our course and headed west. Cloud base and visibility was good as climbed to fly over the Pennines . We were making good progress until we got to Sawley, just east of Clitheroe. We had been able to clearly see the chimney of Ribble Cement but as we approached Sawley the chimney was rapidly disappearing. 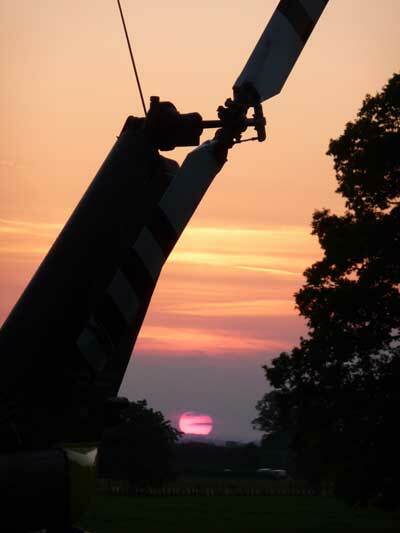 There was no clear sky to the north or the south so Phil made the decision to put the Huey on the ground. We were scanning the fields for the best location and chose to land at the back of the newer build houses just off the A59. This would mean we would be able to make contact with civilisation rather than being on the wrong side of the river! The residents had the shock of their lives. They'd obviously heard us and had come out to see what was making the noise only then to be confronted by the Huey turning around and putting down at the end of their gardens. Geoff and Helen Porritt came to meet us and to ask if there was anything they could do to help. We explained the situation and they welcomed us in for a brew and sit the weather out with them. They were extremely hospitable and we had a very enjoyable few hours chatting about all sorts. By six o'clock things were looking brighter outside and the cloud base was rising. Phil checked in with Blackpool and Neil to get the latest weather information. It was looking promising so we waited another 30 minutes to make sure that the weather was indeed continuing to get better. Phil, after one more phone call, decided we would continue on. 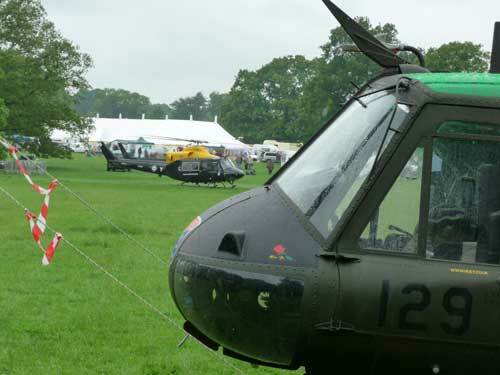 I think Geoff and Helen were quite disappointed; they hoped we'd have to leave the Huey over night. After some photos of them with 509 we once again wound her up and lifted in to the sky and headed of to Blackpool . Visibility was good once again but we could see rain and clouds ahead as we flew down the M55. In no time at all we were on the ground on helipad three. We secured the rotors, unpacked only what was necessary and locked her up. Jo was at the airport to greet us and give us the keys to the car. An interesting weekend was had, not least by us with our efforts to get home, by those that came to see us and those that had a surprise visit. As we always say 'have time to spare, go by air'.